This recipe for parsley tea is super easy and quick to make! And you can use either fresh leaves or dried leaves. The recipe below uses dried and fresh, and both work really well and come with a whole host of health benefits. Personally I prefer fresh, but if you've only got dried, it's fine to use that, you'll still get a tasty cuppa and reap some of the many benefits. That's it! 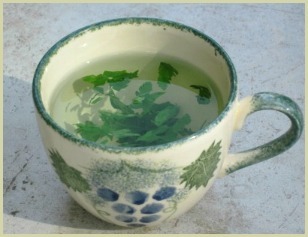 A refreshing, healthy parsley tea in no time at all! Making spice and herbal teas are an excellent way of enjoying the numerous benefits of plants like folk have been doing for millennia. Read more on the many medicinal, well-being and all round parsley benefits. And even if you're not ill, they are packed with vitamins, minerals and antioxidants etc, that are beneficial to your well-being. Even though most of us use this herb just as a garnish, it's actually a nutritional powerhouse! Rich in minerals and vitamins A, C and K, it has been proved to be useful in balancing hormones, fighting anaemia and boosting the immune system to name a few uses. Growing the herb yourself is the easiest way for a regular supply of the freshest, tastiest leaves. Click here to read my detailed step-by-step tips and advice on growing parsley. Image Links to More Herbal Tea Recipes You May Enjoy!